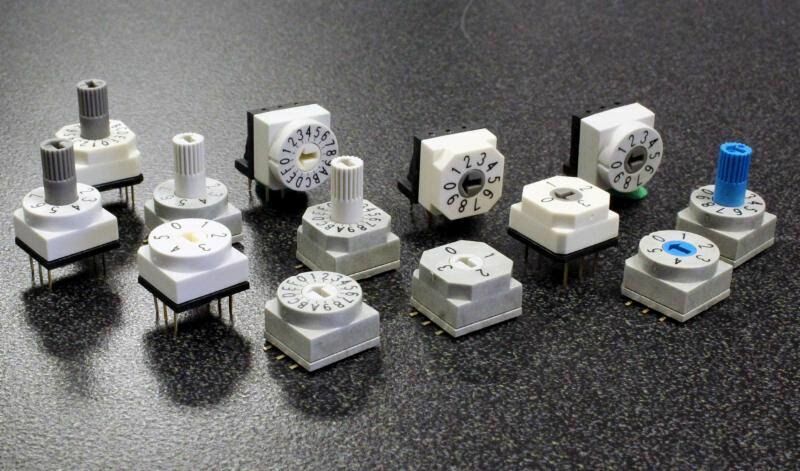 CIT Relay & Switch is now offering Encoded Rotary DIP switches in two sizes. Available with multiple terminal options, both the RD07 and the RD10 offer packaging options of tube or tape & reel. Lead-time averages 6 to 8 weeks. Volume pricing is dependent on option choices. Contact CIT directly for a quote and sample to solve your process sealed switch needs. The 7mm RD07 Series is sub-miniature in size, offering a flush arrow, 4.9mm knurled slot or 4.2mm flat slot actuator style option with three positions from 4 to 16. The RD10 is 10mm in size with five positions from 4 to 16. Actuator style options for the RD10 are flush arrow or 7.3mm knurled arrow. Both the RD07 and the RD10 are IP67 process sealed with code options of Real Code or Complementary Code.